From Eyebeam’s Director Roddy Schrock about the application process for Eyebeam’s residency program. I look at a lot of applications. Every year. This year, I read 414. It’s part of my job, and I enjoy it—every once in awhile, you spot unbelievable potential bubbling up. You find research that need a home like Eyebeam, where it can grow in voice and power. Eyebeam, at its core, is built from the idea that artists should be leaders in technology. This isn’t a radical idea and for most of history it hasn’t been. When the world is filtered through lickable interfaces and algorhythmic sieves, we need artists to help us navigate more than ever. Those artists and like-minded engineers who want to work through technology together, in order to make a real and positive difference, come to the organization for inspiration and creative “blade sharpening” through research, collaboration, and iterative production. That can be seen in the work of alums who include artists who became theorists of surveillance culture like Zach Blas or inventors of open-hardware businesses like littleBits. Take a tour in 360 of the Eyebeam studios with alum Pam Liou. May not work in all browsers. View video. How do we decide who to invite to join us in our mission? It is an important decision for the organization especially given that 30% of our budget goes directly to artist payments. Choosing to whom we’re going to give a big part of our total budget should be hard. Especially when you consider how many people are working in fields that are still taking shape—like artificial intelligence, cryptocurrency, or digital social justice. It is an intense process with commitment by the entire staff as well as a panel of external jurors. After six rounds of review, extensive interviews, several discussions, and maybe a few arguments, the puzzle starts to reveal itself and a final group of residents begins to make sense together. That’s not to say that we don’t miss people. One of my regrets is not advocating more for Laura Poitras when she applied at an early stage in her career, long before she became known as a filmmaker who’s helped to reveal the true extent of government overreach. Follow the theme… This year’s Open Call was specific. We were calling for people to analyze and redistribute power. Get motivated or even inspired about the theme—but don’t try to cram it in if it just won’t fit. Get into details… Tell us exactly what you want to do while at Eyebeam. We expect that it will change, but people who can get down to brass tacks about scheduling and logistics inspire confidence in reviewers. Choose your tools… Make sure that the tool fits the use. For example, I noticed a wave of interest in Virtual and Augmented Reality, even when it wasn’t appropriate for the project. Technology isn’t just… Our vision of technology includes more than just gadgets, but all collective techniques for survival and smart augmentation. That isn’t limited to computation and hardware—we’ve had strong applications from people working in occult magic as technology! And lastly… Make sure that it’s clear why you are passionate about what you do. Eyebeam thrives when its residents are deeply committed to their practice and unafraid to show their personal relationship to their work. Something that’s truly inventive has to come from the heart. Follow Roderick Schrock on Twitter @rddy. 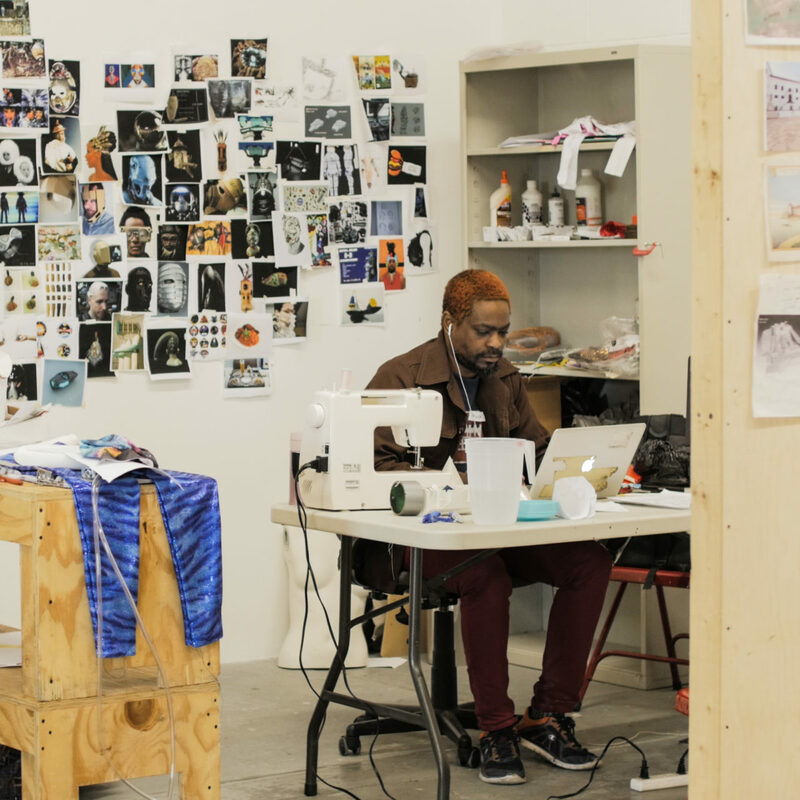 Image: Ayodamola Okunseinde, alum, in his studio iterating through designs for futurist artifacts.